As recipe collection moves out of the card box and into the computer, there has emerged a small cadre of Mac programs designed to help you find, categorize, share, display, and cook your food. SousChef 1.2 is a compact program with an iTunes-RSS feed sensibility that can help you get your meal off to a good start. Recipe programs cater to different types of cooks: Some are looking for ease of use in importing and exporting recipes from their favorite Web sites; others are concerned with having a variety of import and export options available to view and share recipes while at friends’ homes; still others want to record every detail down to the grocery store aisle where ingredients are available. The programs I’ve seen recently vary according to how much detail the user wants, and how much customization and automation they require. SousChef is somewhere in the middle. It’s not super automated, nor does it have an abundance of specialized sections. However, it’s simple, friendly, easy on the eyes, and offers some appealing and practical capabilities. SousChef opens to reveal a pleasant interface, and if you’re familiar with Apple apps such as iTunes and Address Book, you’ll immediately respond to its visual cues. Importing recipes is intuitive, and works the same way for all sources, such as Web sites or text. A recipe importer lets you copy and paste an entire file into an import template. From there, an innovative environment lets you select and tag text for sections like Ingredients, Directions, Notes, Time, Yield, Category, and more. Placing images couldn’t be easier: Just drag and drop an image from a Web site or your hard drive into the recipe template’s picture well. You can also designate the metric system for ingredient measurements, which is a huge convenience for anyone who doesn’t live in the U.S.
Sous Chef’s interface is pleasing and easy to understand but it still has some bugs. The program supports text, rich text, and text-based .pdf formats for both import and export (and, additionally, .doc format for import). The only automatic, one-click import, ironically, is for competitor MacGourmet ( ). SousChef has additional nifty features. In the Preferences pane, you can designate universal ingredient substitutes. For example, if you always use margarine instead of butter, or soymilk instead of cow milk, you can make those substitutions in the prefs. After that, anytime those ingredients appear in a recipe, the alternate ingredients are available to choose. However, this feature did not always work, either because the quantity was not specified or there was a variation in the ingredient such as 2% milk instead of just milk. Of course, you can always edit the substitute into the recipe manually. SousChef gives you an elegant way to create grocery lists. You can choose a recipe and then create a grocery list from it. You can then access that list from the sidebar. Checkboxes next to each item let you check off ingredients you already have and it’s easy to add more items to the shopping list, even if they’re not part of a recipe. You can scale the recipes, convert them to full screen viewing, and have your computer read the directions back to you while you’re cooking. SousChef’s marquee feature is the cloud. Using the program’s search engine, you can type in a term like Tofu or Sweet Potatoes and, from the SousChef Web site, all the recipes with those ingredients will come flowing into the interface for you to view, just as if you had the recipes in your database. And, you can easily import any of these recipes into your own local database. The company says there are some 81,000 user generated recipes as I write this, and likely more by the time you read this. You can search recipes according to ingredients, category, cuisine, and recipe name. Better still, you can sort within the results to get, for example, only five-star, vegetarian recipes. This is the quickest user recipe import option I’ve seen of several recipe programs I’ve looked at recently. The search engine does not use Boolean operators, so that you can’t say Sweet Potatoes Not Chicken and then eliminate all the chicken dishes. But of course, you only import the recipes you want to use into your own library. Each ingredient also has a pull down menu that you can use to classify it. You can note that you always have a particular ingredient or that you need to put it on a shopping list; you can substitute an ingredient for something else or change its yield. Or you can find other recipes that use this ingredient. While there’s no built-in wine and beverage list, you can easily create one. It’s easy to e-mail, print, or post your recipe on a blog, too. The program lets you use iChat Theatre to share recipes. You can automatically create a shopping list from any recipe and then check off the items you already have. There are a few things that don’t work as expected. When I tried to edit a recipe, it gave me an error message says “Multiple Validation Errors Occurred” and there’s no way to figure out what that means. And while the documentation says you can import recipes from recipe Web sites via the Services menu, that feature does not work. There were small anomalies in trying to scale recipes. In changing the number of servings for example, 3/4ths of a cup became 6/4ths instead of a cup and a half. Not wrong, but hard to visualize and not terribly elegant. In addition, the scales are relative rather than absolute (you can double, triple, and quadruple a recipe or halve it), but, in this version, you can’t revert to the original values. 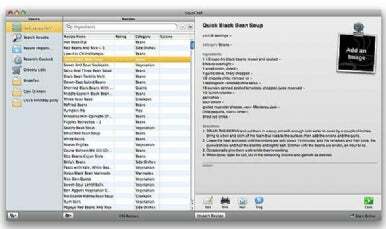 SousChef 1.2 is enjoyable and easy to learn for people looking for a simple way to gather and share their recipes and cook and shop. The import feature is fun, and importing recipes from the cloud presents lots of opportunities for variety. However, the version of the program I tested was too buggy and some of the features did not work precisely as advertised. The developer is actively working on fixes for some of the problems cited here. If all of the features worked flawlessly, SousChef would be right up there with the best of the recipe apps.